The good news is that my left hamstring is healing nicely and quickly. Yay! I’ve nonetheless been taking it easy, particularly since I am hoping to improve my scores for WODs 1-3 of the Paleo Challenge. I will definitely complete the Paleo Challenge again, and I look forward to promoting it at the box. I certainly feel stronger! Whilst I didn’t complete strength for Barbell Club on Sunday (the day after the competition), I did complete conditioning. And this may have been one of my favorite workouts. 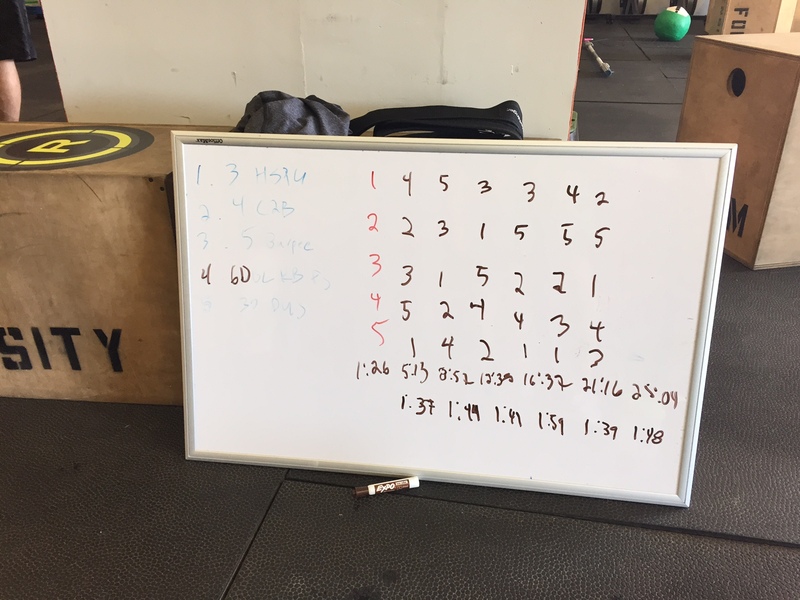 For each of the 7 rounds it was up to the athlete to decide order — but to ensure that the workout was constantly varied. The most difficult aspect of the workout was remembering what to do next! 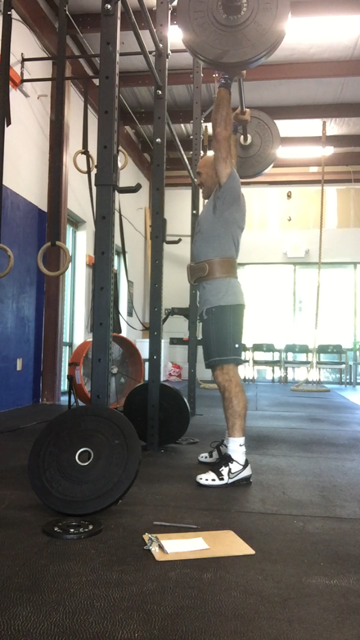 I suggested to Coach James that I complete strict HSPUs and C2B pull-ups, and he agreed. I wanted to ensure that I didn’t move too fast and potentially injure myself. I’m just that smart. I truly am. i completed the first round in the order listed, i.e., beginning with HSPUs and ending with dus. Gah! It was difficult ending with dus. KB FSs were the most difficult of all of the activities each and every round. The picture below captures the order that I completed, accumulated time, and time of each round. My goal was to complete each round in under 2 minutes, and I achieved that goal (although barely on the 5th round). HSPUs got challenging during the 6th round, and I briefly contemplated kipping the last rep. 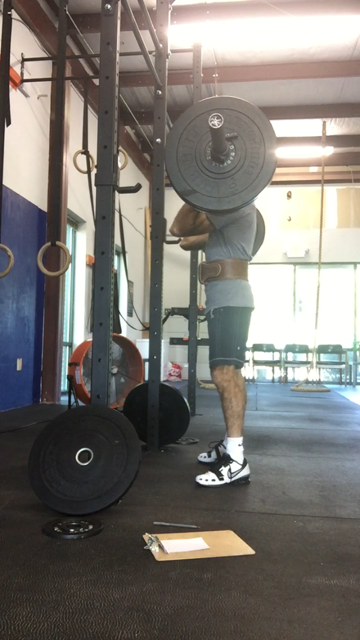 I instead rested for a moment and successfully completed the rep. I completed the last round of HSPUs unbroken! I rested yesterday. The whole damned day. And it was good. I only completed strength today. Just the damned strength. And it was tough. Weights were 120, 105, 90, & 75. Sh!t got heavy — and stayed heavy. I recorded, and am happy to say that my form was very good. Hips dropped, full extension (up on toes even), and locked out at top. I completed each rep as a single, i.e., I reset before lifting. At the end of the round I proclaimed, “That sh!t got heavy.” Haha! I strung most together, i.e., received bar for dip. Weight felt relatively light at start and very heavy at end. I again strung most together. I have asked the lovely and talented Diane to be my partner for Superfit competition — and she acquiesced! How f@cking awesome is that? !